Congratulations to Jake Holthaus, the 2016 recipient of the Worly Award of Excellence. 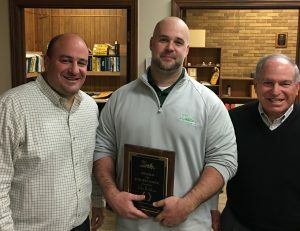 Jay Worly, Chairman and CEO, released a statement this week and presented Jake with an award at Worly’s Cincinnati branch. “Jake does an excellent job servicing all our customers in Cincinnati as well as interacting in all the branches of Worly Plumbing Supply,” stated Jay Worly. As part of this award, Worly will make a contribution to the Columbus Cancer Clinic in Jake’s honor. Mr. Holthaus is the twenty-sixth honoree to receive this award at Worly Plumbing Supply.